Mixpresso's Single Cup Coffee Maker is simple to use and engineered to always deliver great results everytime. No wonder why so many cheap Chinese imitators are trying to copy our design. Buy with confidence. Always Ready One Touch Button Operation for On/Off - Boils the water automatically and shuts off after Three Minutes. Each K-Cup Machine comes with a special coupon to try Mixpresso's Gourmet Roasted Coffee Capsules . No compromises on what you love about great coffee from home with Mixpresso's Coffee & Single Cup Brewer Machine. ☕️ HASSLE FREE CLEANING: You can simply wash K cup coffee pods drawer under a tap. It suits most of the single cup coffee pods and coffee filters. The coffee maker can be filled under a tap and it is easy to carry. 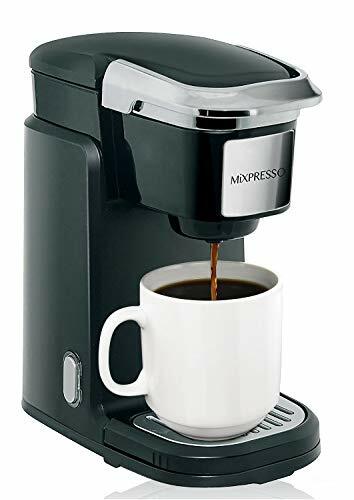 ☕️ SMART COFFEE MAKER: 800 Watts heating element that brews your favorite flavors of K cup pods fast with pre-heating time as short as 2 minutes. It has an auto-off function which turns off after 15 minutes to save energy. This coffee maker saves your time, money and delivers you a delicious cup of coffee anytime anywhere. ☕️ ONE TOUCH FUNCTION: It has one button to start and shut down. The single touch button mechanism delivers and makes the best cups for a variety of coffee drinks whatever you want to choose to drink.